WHAT a difference a bit of rain makes. The word around the Warwick Cattle Sale was that recent storms could generate enough growth in pastures and forage paddocks across the district to carry stock through the winter. So farmers held onto their stock and the yarding fell by about 66 per cent on the previous sale, to 709. The shortage pushed prices skyward. Calves and vealers were up about 44-66c/kg while were up 19-49c/kg. Even cows increased by 17-50c/kg. 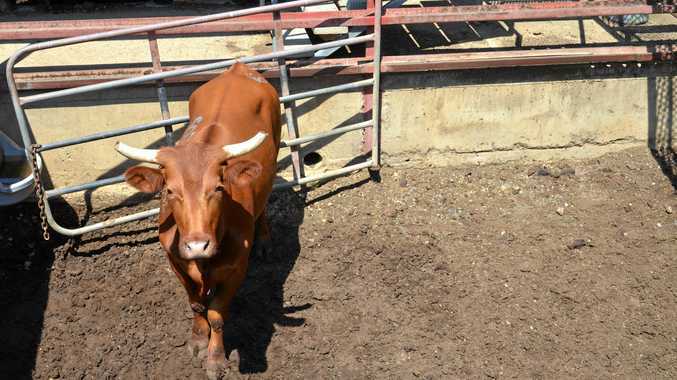 The yarding was equally low at the Toowoomba Cattle sale, with only 317 head offered. Veteran producer Noel McConville said there could be some promise in the weather. He has farmed in Emu Vale and Swan Creek for more than 60 years and expects prices for young cattle will continue to climb. "This rain must have been reasonably widespread to reduce the numbers at the cattle market because they have been coming in from hell, west and north in recent months,” he said. Mr McConville mostly trades in yearlings and vealer cattle but had to offload half his heard since the start of the year as his feed and water dried up. He said the market was flooded of late and the current price increase came off low base. "The price has been well down but it depends on how far back you want to go,” he said. The current spike could be an aberration. Depending on what the weather does over next month producers could resume de-stocking. "I'll hold as many cattle as I can, but we are coming into winter with no natural grass on the ground,” Mr McConville said. Those natural pastures needed January rain to develop ahead of winter but that moisture did not materialise. "It is a bit too late to expect a good grass coverage but some of the bluegrass and liverseed grass should do okay,” Mr McConville said.